The same quality construction as our stationary box design, but our castered stand is equipped with two swivel locking casters and two rigid casters to allow the plate and stand to be easily rolled. Leveling bolts are located on top of the stand. Stands are constructed with three-point suspension to properly support your granite surface plate. All plates are marked with three suspension points on the bottom of the plate, which coincide with the three suspension points on the top of the stand. The alignment of these three points will ensure the guaranteed accuracy of your plate. 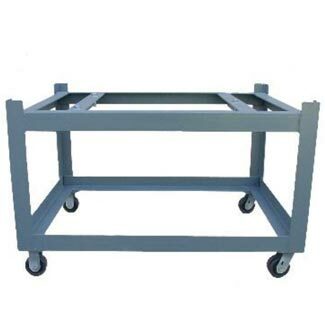 Stands are constructed from welded steel to provide exceptional strength and stability. Painted a durable gray finish. A 36” working height is provided unless otherwise specified. Powder coat paint finish or custom colors available for an additional charge.